Growing up there were a few favorite meals which I always looked forward to. Granted I do not remember being the foodie that I am today – at least I don’t think I was – but this meal always generated excitement when I saw it at the dinner table. These days it is a favorite in our house. My mom would use a couple of cloves of garlic but I use as many as eight to ten cloves depending on the size of the cloves and how much meat I have. We are not shy with garlic in our household. I am unsure of the origin of this dish, but given the Sicilian heritage on one side of the family I always assumed that this is a Sicilian dish. Place a little olive oil in a wide frying pan for which you have a lid and quickly brown the meat for a minute on each side, adding salt and pepper to taste. Fry one or two slices at a time and move them to a plate when done. 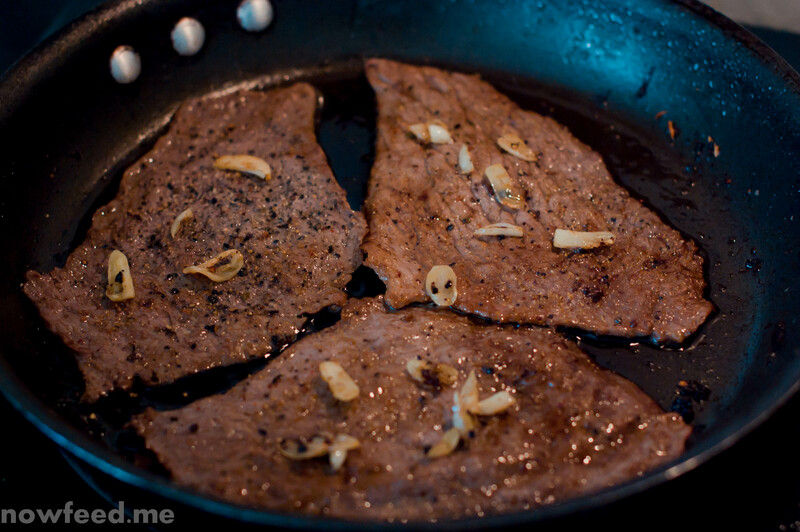 Turn the heat down a little, and sweat the garlic for a minute or two, adding a little olive oil to the pan if needed. Do not let the garlic brown, but remove it from the pan to a small bowl before then. 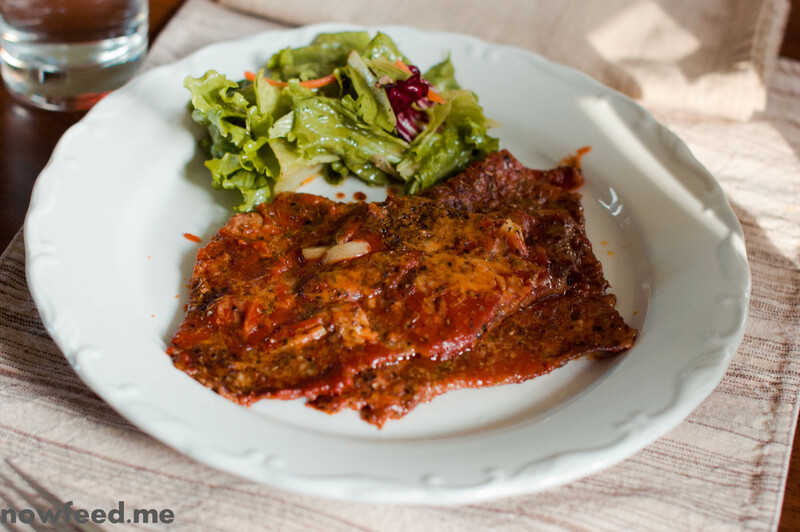 Now in layers, return the beef slices to the pan covering as much as possible, spread a few slices of garlic so that each slice of meat has a few, then spoon some tomato sauce over it all. Sprinkle some oregano, then repeat the layers until all the meat is back in the pan. When you get to the last layer (usually second or third), sprinkle some oregano and Parmesan cheese over the top. Bring to a simmer then partially cover and turn the heat down so that the tomato sauce simmers lightly. Cook for about 20 minutes. 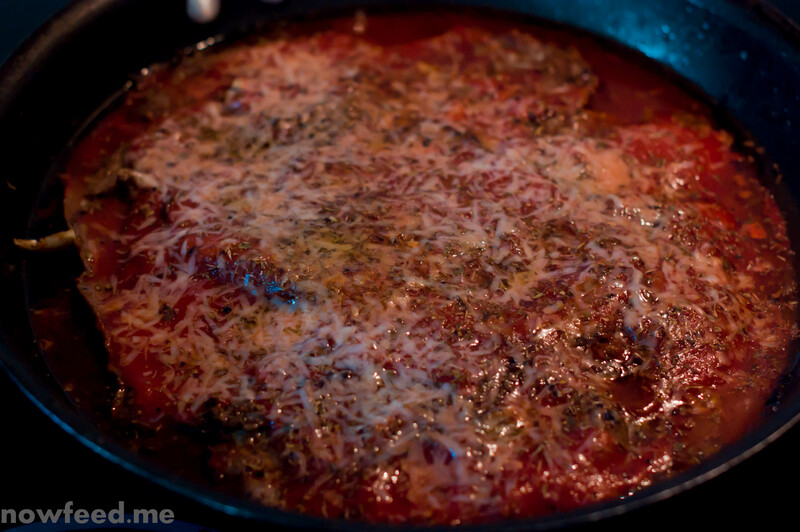 The sauce will darken a little, the cheese will melt, and the flavors will all mix together. Serve with a salad and a few slices of crusty bread. The tomato sauce should be a little thick, not watery. Minus the bread for serving this this is gluten free, a consideration in our household. Increase the meat to two pounds for four adults (or older children). 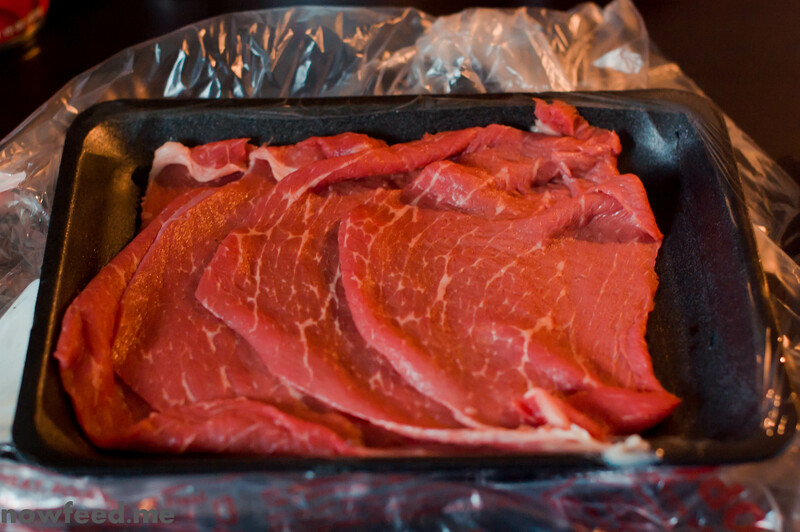 This entry was posted in Food, Recipes and tagged beef, Italian. Bookmark the permalink.